On Monday evening the mighty Mustangs made their way east to Edgeworthstown in an attempt to tame their hosts Longford Torpedos and claim the LLR League title. Having gone through the season unbeaten up to this point, a victory would deliver the league title to the Mayo outfit with several games still to be played. The game started in a familiar fashion with Fiona Feeney winning the jump, followed by an opening score from Mustang number five, player-coach, Siobhan Kilkenny. Then Kilkenny, in fashionable style, pulled the trigger with her characteristic style three-pointer and the marker was laid down. Mustangs were up 26-14 at the end of the first quarter and Ciara Griffin was proving uncatchable on the break, racking up eight points in that quarter alone. Sinead Hughes scored some lovely pull up shots and Kilkenny was solid as ever, the two ending on four and seven points respectively for the first quarter. Lorna Moran kicked things off in the second quarter for Mustangs scoring from strong offensive positioning, that combined with Kilkenny adding nine to her total and Grainne Flynn chipping in with six points and Anita Hoban rounding off the scores, Mustangs finished up up 45 points at the half time buzzer and leading the game by 19. The second half saw return visits for Kilkenny, Flynn, and Hughes to the free throw line and the ladies cashed in on the shot opportunity. Fiona Feeney displayed some lovely board work in this period and Sheila Cunningham concluded the scoring for Mustangs on a final scoreline of 69-57. This win has meant that with one away game remaining, Mustangs have, without a defeat to date in the league, secured the Lonleitros (LLR ) women’s title for 2017/18 season. 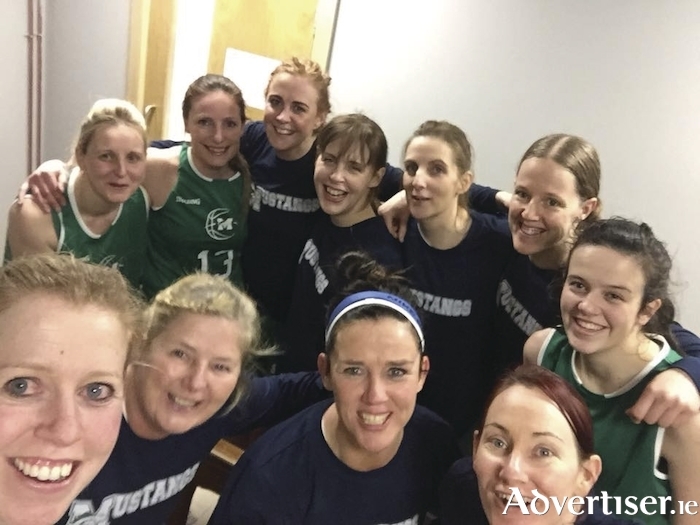 Mustangs: Siobhan Kilkenny 24pts, Grainne Flynn 9pts, Ciara Griffin 8pts, Orla Brennan, Lorna Moran 2pts, Karen Mulherin 8pts, Niamh Griffin, Sinead Hughes 9pts, Anita Hoban 2pts, Fiona Feeney 4pts, Sheila Cunningham 2pts. Mustangs travel to Castlerea on Thursday, February 22, to play Cosmos for their final league game of the 2017/18 season. The top four play offs will be the weekend of March 9 to 11 in Boyle. Mustangs will play on the Friday evening against the fourth placed team in the league.